2017 renovations valued at R122 000 will be undertaken to fix water leakages at the Wits Origins Centre. Ongoing water leakages in the state-of-the-art Origins Centre building have led to flooding in the basement and the cost of renovations so far this year is R122 000. According to Campus Planning and Developments’ project manager, Marietjie van Niekerk, the renovations to the Origins Centre’s concrete slab are the final step in a series of waterproofing efforts aimed at ending water leakage in the building. Water damage in the Origins Centre basement. Photo: Kayla De Jesus Freitas. The leakages started prior to 2009 when Van Niekerk took over the project, and have resulted in damages to the Origins Centre basement which houses Wits’ invaluable archaeological archives and the map room. The map room itself had to be quarantined in 2014 due to a mould growth. According to Dr Thembiwe Russell, a senior researcher at the School of Geography, Archaeology and Environmental Studies, the leakages may directly impact the archives. The renovations have also affected Café Fino. Manager of the cafe, Jared Frey says that he is “fairly frustrated due to the fact that the initial waterproofing should have solved the problem, but it started leaking worse this year”. 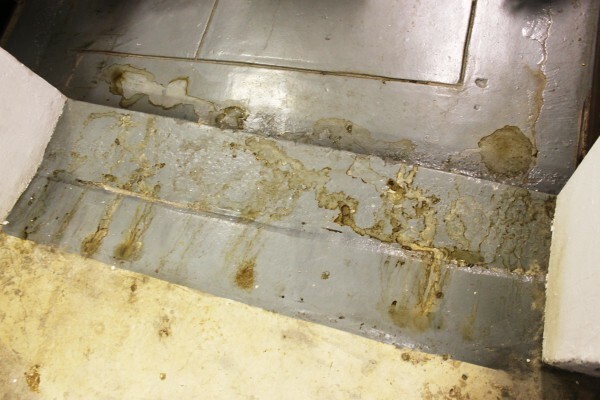 Concept Clean Africa documents from 2013 that were obtained by Wits Vuvuzela note “a crack in the concrete slab in front of the Coffee Shop” as a possible cause for the damp issue in the basement.